In a previous post we gave you 5 reasons to buy Evanger’s pet food, so you may be thinking “how much does Evanger’s pet food cost?” It’s a lot more affordable than you think! In our guide below Evanger’s food is compared (in price, not quality) to the “big advertising brands” you’ll find in other stores. Here is a snapshot of some of the Evanger’s food we carry. You will be amazed at the quality cat and dog food you can buy for the same price (if not less) than what you are spending on other brands. 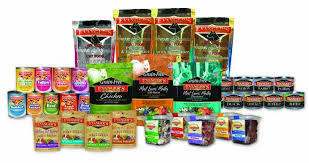 Evanger’s is one of the best deals for quality pet food. You can get this for as low as $1.16 a pound with our loyalty program. Foods like Purina Pro Plan (2 Stars), Iams Healthy Naturals (2.5 Stars), and Eukanuba Premium Performance (2 Stars) cost $1.20-$1.55 per pound at stores like Petco and Petsmart. Unlike Evanger’s healthful pet foods, these “big brand” foods contain poor protein sources like by-products, and animal digest. They also have cheap grains like corn meal, brewer’s rice, and corn gluten meal. These grains have no nutritional value and often cause allergic reactions in dogs due to mold and grain mites. This is a real winner: buy 5 star food for as low as $1.44 a pound! This food is full of protein with a guaranteed analysis of 30%. Compare it to Purina Beyond (rated 3.5 stars), which costs $1.49 a pound, has brewer’s rice as the second ingredient, contains no fruits or veggies, and claims 26% “protein.” Also compare it to Blue Buffalo Adult Fish & Sweet Potato (rated 4 stars), which has brown rice, barley, and oatmeal in the first five ingredients, “natural” fish flavor, and only 22% protein for $1.65 a pound. We sell the best dog food in Ormond Beach at the best price; we’re the only store in Ormond selling 5 star quality food for under $2.30 a pound. Ingredients Include: Beef Meal, Sweet Potato, Peas, Rabbit, Beef, Pork Meal, Beef Fat, Dehydrated Alfalfa Meal, Pumpkin Seed, Cranberries, Blueberries, Kelp, and Chelated Minerals. Here is another 5 star rated food with tons of quality protein sources for as low as (drum roll please) $1.78 a pound! Get a guaranteed analysis of 30% protein. Compare this to Blue Buffalo Beef (rated 4 stars) at a price of $2.25 a pound! This food has only 24% protein that is mostly sourced by chicken meal, turkey meal, and pea protein. That doesn’t sound very meaty to me. Abracadabra in Ormond Beach offers 5 star quality grain-free pet food for under $2.16 a pound. Did you know? Evanger’s also makes amazing hand-packed canned food with human grade ingredients. Only $0.12 an ounce! Compare it to Purina Pro Plan or Purina One (3 Stars for $0.12), which have meat by-products and food coloring; Hills Science Beef & Barley (2.5 Stars for $0.12), which has corn, soy protein, and food coloring; or Eukanuba Hearty Stew (2 stars for $0.15), which has meat broth, chicken by-products, wheat gluten, meat by-products, and food coloring. Only $0.14 an ounce! Compare it to Beneful Romana Style (2 Stars for $0.18), which has meat by-prodcuts, wheat gluten, soy flour, and food coloring, or Cesar’s Filet Mignon (2.5 Stars for $0.20), which has meat by-products, chicken by-products, and food coloring. Only $0.21 an ounce! Nothing compares to the slow cooked, human grade quality ingredients of Evanger’s Hand Packed line. Dog and cat owners tell us the wonderful difference they see in their pets after starting them on Evagner’s pet foods. By switching to Evanger’s, it’s easy to save money and feed your dog better. Abracadabra Pet Center is here to help you do both.